Following the first test flight, the DC-8 crew reported a “humming” sound that seemed to emanate from one of the sampling inlets on the starboard side of the aircraft. The crew subsequently flew several additional check flights to find the source of the humming and ensure that the aircraft itself was airworthy. 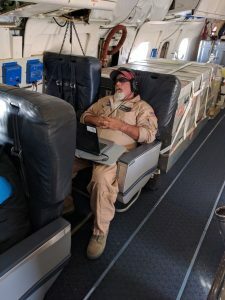 The first science flight of the mission, from Palmdale to the equator and back again, was scheduled to occur on July 28, but due to the ongoing humming issue, the flight was scrubbed. Needless to say, this was a disappointing way to kick off the mission, but it is crucial that there are no potential safety issues with the aircraft before departing to remote locations for a month long deployment. An additional check flight was flown, and this time the crew was able to locate and fix the offending inlet. The video below says it all. This folks, is why we do check flights. The science flight was rescheduled for July 29 and went off without a hitch. 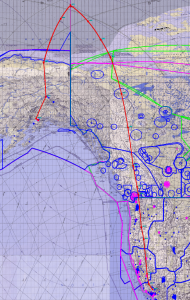 The flight track took the plane south from Palmdale to the equator and back, completing 6 vertical profiles over the open ocean. At times the jet was flying only 500 ft above the blue waters of the Pacific. 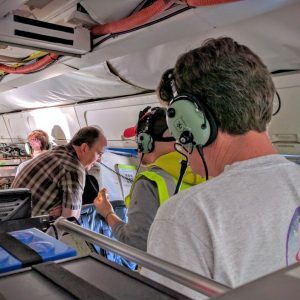 Although the veteran flight scientists and DC-8 crew have built up a tolerance for the sometimes gut-churning maneuvers, journalists that went along for the ride did not seem to appreciate the ups and downs quite so much, likening it to riding a rollercoaster in the air (Flying a Rollercoaster for Science). Near the equator, the plane intercepted some remarkably clean air where NOy (total reactive nitrogen oxides) was observed at levels as low as 70 pptv, which is the lowest NOy that NOAA scientist Tom Ryerson has ever seen. Some are less affected by the flight maneuvers than others. 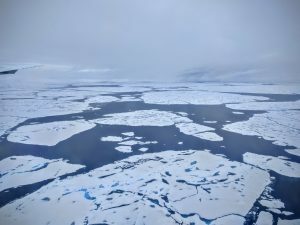 August 1 it was north to the Arctic to kick off the ’round-the-world deployment. The flight was astoundingly scenic, offering breathtaking views of Mt. Shasta, Mt. Hood and Mt. Baker as the crew headed towards the North Pole (magnetic north that is, which is currently at about 80°N). North of Deadhorse, Alaska some low altitude flying over the Arctic Ocean provided a close-up view of the patchy summer sea ice. 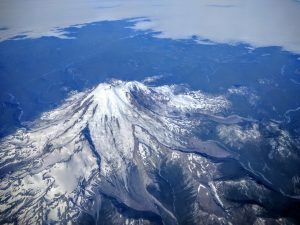 On the northern portion of the flight, the plane encountered a particularly interesting air mass aloft containing well-aged emissions from biomass burning that was identified by certain gas-phase VOC tracers and organic and pyridine-containing aerosols. These chemicals were most likely transported from Siberia, where wildfires have been burning for several months ( Wildfires Rage in Siberia – Washington Post ). Brush and peat fires are an annual occurrence across the Arctic, however, fires there and in the lower latitudes have been increasing in both frequency and intensity due to the effects of climate change. Emissions from fires contain a vast spectrum of reactive VOCs and oxidized and reduced nitrogen compounds, which lead to complex atmospheric chemical interactions that impact air quality through, for example, production of aerosols and ozone. The DC-8 will spend two nights in Anchorage before heading south to Kona, Hawaii. Although this trip will include several (admittedly jealousy-inducing) vacation destinations, it is far from relaxing. Science flights last about 9-11 hours each, and those days that we are on station we are often running our instruments on the ground to keep them tuned and calibrated. There is also, of course, the data analysis. Preliminary data is required to be uploaded to the NASA data archive within 24 hours. As you might imagine, this leads to some long days and sometimes long nights. This trip is not a vacation, it’s more like a month-long marathon, and we often push ourselves to the brink of sanity and exhaustion in the pursuit of science. But that is also why we love it. 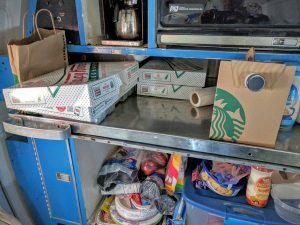 But don’t worry, even traveling the world we still manage to get in our daily intake of caffeine, sugar, and cholesterol.